Add something a little bit different to your garden with these fantastic living willow standards. Their stems, hand-woven into standard form, create a visually stunning centrepiece for any garden, but once they burst into life with growth atop the stem, they can be used in pots and containers as eye-catching specimens or grown in multiples to create unique hedging and screening. The stems will not grow any taller so you can contain the maximum height of the plants, and they can be trimmed, to any shape or size you desire. Plant in pots and place either side of doorways, gateways or entrances for a warm welcome to guests, or plant in groups in troughs or borders to separate off areas or create privacy – they’re versatile, beautiful to look at and just so easy to grow! Add something a little bit different to your garden with these fantastic living willow standards. Their stems, hand-woven into standard form, create a visually stunning centrepiece for any garden, but once they burst into life with growth atop the stem, they can be used in pots and containers as eye-catching specimens or grown in multiples to create unique hedging and screening. The stems will not grow any taller so you can contain the maximum height of the plants, and they can be trimmed, just like topiary, to any shape or size you desire. Totally winter hardy and happy both in partial shade or full sun, these willow standards are a low maintenance, easy to care for plant that will reward you with an outstanding feature. When the willow is first planted you can’t water it enough! Keep well watered until it has formed a good clump of root. 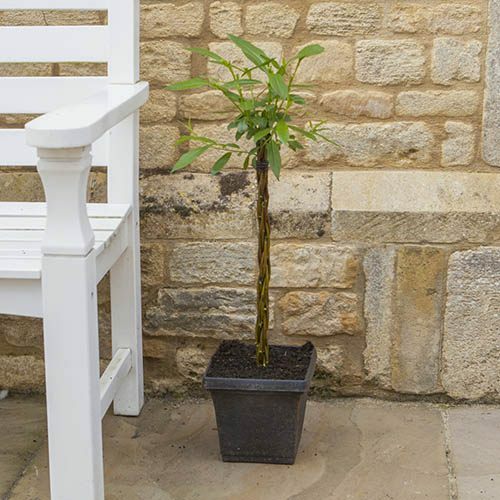 Supplied as standards with plaited stems - already planted into a decorative planter. 50cm total height.